4430 Model gets more horsepower, Tier IVA compliance and updated cab for comfort. 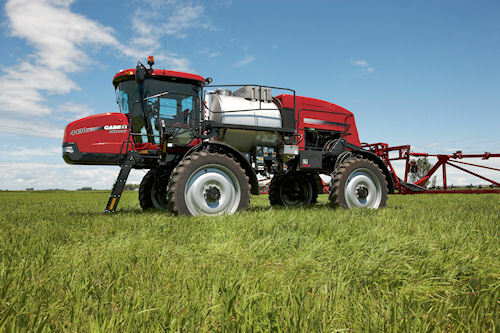 Case IH has updated its Patriot 4420 1,200-gallon sprayer with the new 4430 model that boasts a 325 horsepower engine capable of up to 356 horsepower in a pinch. The tweaked 8.7 L is proven in the lineup, but now has Tier IVA emission compliance using selective catalytic reduction technology to boost fuel economy at the same time as providing the power increase. The Patriot 4430 features an updated Surveyor cab design based on the Steiger tractor cab, which increases cab space to 132 cubic feet under more glass than competitors. A right-hand console mvoes with the seat for easy access, providing near effortless control of all sprayer functions. Case IH's Patriot 4430 1,200-gallon sprayer sports 12% more horsepower and meets clean air standards without compromising engine efficiency. Outside, an optional 360-degree high intensity lighting system enables efficient night time operation. Also, an optional 120-foot boom with AutoFold Plus makes moving from field to field a snap. The 1,200-gallon capacity tank comes equipped with full length sparge and rinse tubes for product agitation and cleaning. The new Patriot also can be fitted with AFS AccuGuide autoguidance to reduce skips and overlaps, with the AccuBoom automatically turning on and off sections to correspond with position and on-board field maps.